A gem of a plant from 1862, with abundant starry flowers edged in violet. Its sweet fragrance has been likened to almond, and its vigorous growth will create an enveloping cloak of bloom on shrubs or on walls and fences. Summer to fall bloom. Easy culture. We grow this fragrant vine on our gazebo, and by fall the gazebo disappears in a froth of fragrant white blossoms. Fluffy silvery seed heads follow the bloom. The leaves are a leathery dark green. Wonderful! Prune to 1-2' tall in early spring as leaf buds begin to show, removing all dead stems above the buds. 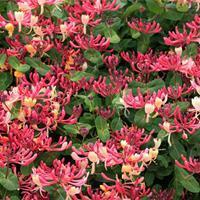 A wonderfully fragrant hardy woodbine that is NOT invasive and nurtures hummingbirds with the long upward-curving nectar rich blossoms, and birds with the crimson berries in fall. A disease-free reliable and free-bloomer with masses of cherry red buds that open creamy white and age to butter yellow. 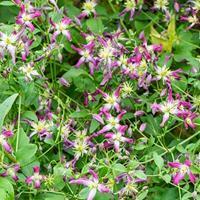 Blooms generously in midsummer and with moderate deadheading, into fall. 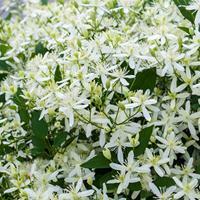 Makes an excellent screen or groundcover and looks great spilling over a wall or fence but also can stay relatively compact with some pruning after flowering.